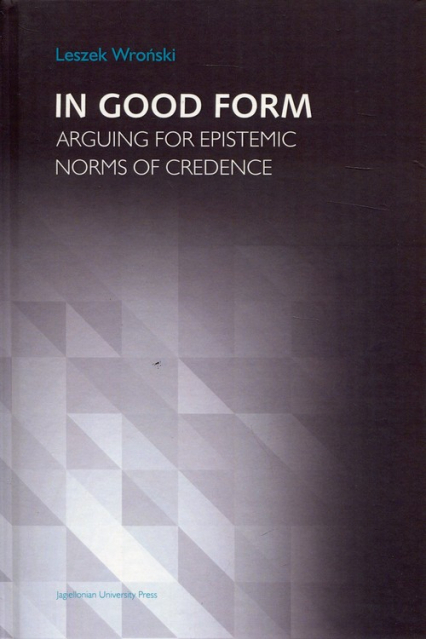 The main topic of the book is how to argue for formal epistemic norms of credence. The author advocates formal justificational pluralism, suggesting that it is reasonable to use various formal tools, e.g. different “scoring rules”, in arguments for synchronic and diachronic norms. The author first examines various occasions on which modern formal epistemology fails to live up to its “formal” label. Among the topics considered next are: the Dutch Book Theorem and Arguments (which fails according to the author), a novel version of the Principal Principle, and a constructive approach to higher order probabilities. The author argues then that the best method for dealing with various belief update problems is that of minimizing inverse relative entropy, and defends the claim that for evaluating an agent’s credal state at a single moment the Brier Score seems to be the way to go. Wroński’s results are unified by applying proper mathematical methods to different and yet interconnected aspects of key elements of currently ongoing debates about bayesian epistemology. The book is a research monograph on a technically and philosophically advanced topic. The work is not for the faint-hearted, but Wroński definitely succeeds at showing that this is rightly so. By approaching the problems in a good mathematical form Wroński shows that in formal philosophy the devil is often in the detail. And he has quite a lot to learn from Wroński. Leszek Wroński is an Assistant Professor at the Institute of Philosophy of Jagiellonian University in Kraków. His previous book, a study of the prospects of various formulations of the Common Cause Principle, was published as Reichenbach’s Paradise in 2014. He is mainly interested in formal epistemology and philosophy of probability, having authored and co-authored papers on probabilistic causality and the branching space-time theory. He sings in a vocal ensemble specialising in the Baroque period and leads one whose sole period of interest is the Renaissance.